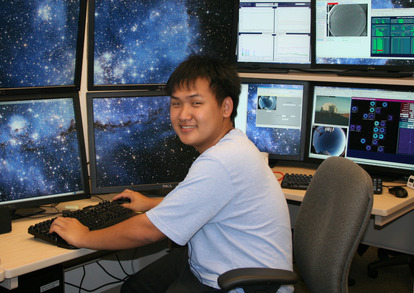 Daniel Hong is a fourth-year Mechanical Engineering major at the University of Hawai‘i at M?noa. He plans either to go to graduate school or to find a career that will allow him to stay in the islands. In his spare time, he mentors McKinley High School’s Robotics Team for VEX and FIRST competitions. The Panoramic-Survey Telescope and Rapid Response System (Pan-STARRS) has several instruments used for observing that will need to be mounted on the telescope. Therefore, I was given the task of creating a universal instrument interface for the third-party instruments associated with Pan-STARRS. To solve this, I designed the Auxiliary Mounting Interface (AMI). When I started, there were no clear definitions for the limiting parameters (dimensions, power, weight, etc.) of the instruments. I interviewed numerous sources and presented a preliminary design review to determine all requirements and constraints for the mounting system. My design worked within these specifications to standardize the telescope-instrument connections and a mounting plate to house them. I used SolidWorks software to create models and used its finite element analysis to optimize the design. A weight limitation of either 40 or 100 lbs was imposed on instruments, due to the limited manpower at the telescope. The final design is a dovetail wall-mount that allows any instrument to be easily installed, removed, and realigned consistently to its original position. A critical design review, needed before approving construction, is scheduled shortly before the end of my Akamai internship.